Trent Nelson | The Salt Lake Tribune Brigham Young Cougars guard Nick Emery (4) looks to pass as BYU hosts Weber State, NCAA basketball at the Marriott Center in Provo, Wednesday December 7, 2016. 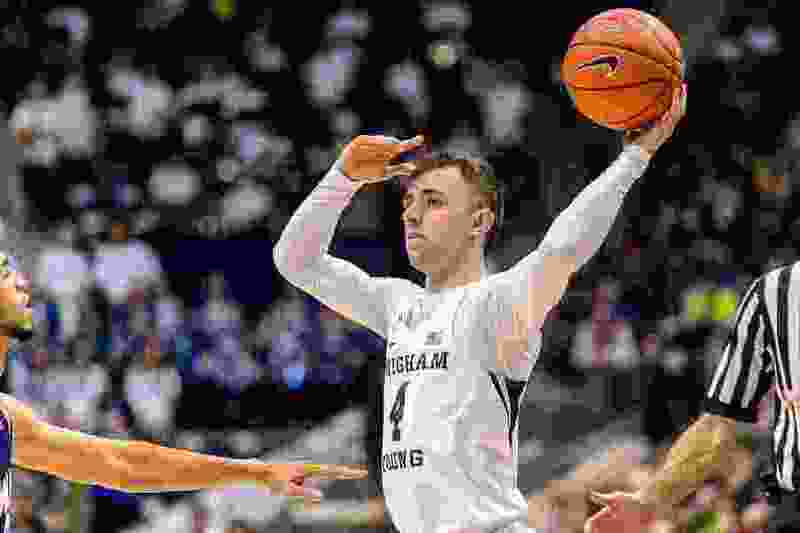 Provo • The NCAA’s Division I Committee on Infractions (COI) came down hard on BYU’s men’s basketball program Friday in the wake of star guard Nick Emery’s acceptance of improper benefits over a two-year period from June 2015 to June 2017. The program has been put on two years of probation, 47 wins during the 2015-16 and 2016-17 seasons will be taken away, one of the 13 scholarships awarded annually will be taken away, future recruiting will be restricted, and BYU must pay a self-imposed $5,000 fine. The scholarship reduction was also self-imposed. BYU said Friday it will appeal the portion of the ruling that calls for it to vacate the 47 victories that Emery played in during the two seasons in question. According to the COI’s report, four BYU boosters, acting independently, provided more than $12,000 in impermissible benefits, from all-inclusive vacations, cash, meals, free golf and the use of a car. • Booster 1, whom The Salt Lake Tribune reported in October of 2017 to be Brandon Tyndall, an executive at Fun For Less Tours, provided extra benefits to Emery totaling an estimated value of $10,262. All of those benefits came after the two seasons in which BYU has been asked to vacate wins, but are the ones that triggered BYU’s initial investigation and led the Cougars to self-report to the NCAA. Tyndall paid for Emery and his then-wife to travel to New York and Frankfurt and Munich, Germany, in April and May of 2017. The expenses included airfare, hotel lodging, cash, car rental, transportation to the airport, Broadway theater tickets and the use of a corporate credit card to pay for miscellaneous expenses and totaled $7,156. From May 22 through Aug. 21, 2017, Tyndall provided Emery with the use of a new 2017 Volkswagen Jetta and paid to insure the car as well. Total value of the automobile benefit was listed at $1,952. The COI report notes that “the student-athlete’s brother” — presumably former BYU guard Jackson Emery — “repaid nearly all of the $10,000 associated with the trips, car use and insurance.” Jackson Emery did not return an email seeking comment. • Booster 2, whose identity was not provided, left $200 in cash for Emery in his locker at the Marriott Center while BYU was practicing some time in October of 2016. The same booster on at least three occasions between August 2015 (when Emery returned from a church mission to Germany) and August 2017 invited Emery to play golf at a local country club (presumably Riverside Country Club, Provo’s only private golf club) and paid for the guest fees and a a meal using his club account. The value of those golf outings were deemed to total “at least” $240. • Booster 3 arranged for Emery and his then-wife to stay two nights during Christmastime in 2016 (Dec. 23-25) at a lodge in Park City, believed to be that booster’s timeshare condominium. Lodging was valued at $360 per night for a total of $720. • Booster 4 on at least 10 occasions between August 2015 and August 2017 invited Emery to golf at a local country club and paid for meals after golf using his country club account. Value of those benefits were estimated to be $800. BYU submitted that Booster 4 was not really a booster because they only made a single $650 donation to the school 10 years prior to providing Emery with free golf and meals. The NCAA’s bylaws do not associate booster status with whether or not said booster considers himself or herself a booster, or the value or time of the monetary donation.